Small snap-hook to be used on elastic cords for various sectors. Sturdy snap-hook to be used on back packs and bags. Combinable with items TR and SA. Modern design snap-hook, to be used on luggages and bags. Combinable with items TR and SA. Plastic spring to be used with elastic cords or as a base to make complex snap-hooks like MS ans MST. Sturdy and high tension snap-hook, to be used on bags. Combinable with items TR and SA. High tension snap-hook, for military applications. High tension snap-hook, for miltary applications. New concept swivel snap-hook, combinable with SA and TR items. Swivel and resistant snap-hook, combinable with standard half ring SA or with the specific item RH. New system used to keep together sports gloves. It is made of 3 pieces, 2 directly sewed on the gloves and 1 small hook that keep them together. Small snap-hook, combinable with SA nd TR items. 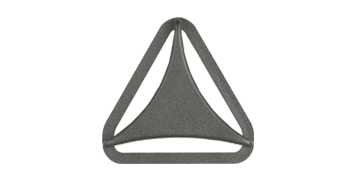 Triangle to be used with snap-hooks, available in various sizes. High tenacity D-ring, it is used in various areas. Can be combinable with snap-hooks. Square ring used to fix webbings, handles and ribbons. Available in many sizes. Strong and practical ring, it is used in combination with snap-hooks. Side attack to be fixed throw 2 rivets. Used as attaching system for shoulder pads. Special item that allows to connect 2 webbings of different sizes. Item to be used on salopettes, to cross braces. 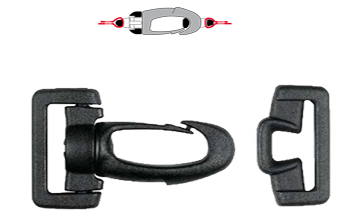 Special low tension helmet buckle, used to guarantee a higher safeness. Is possible produce male and female in different colors. Helmet buckle. Is possible to produce male and female in different colors. 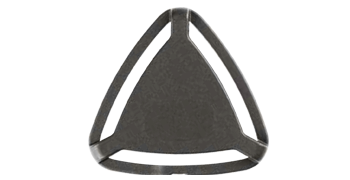 3 exits helmet divider, allows to join 2 webbings together and use them to support a buckle. Small loop used to fix the webbing on helmets. Sewable item specially created to allow the passage of water tubes or cables in/out a back pack. Clip for water tubes. It has cutted bars to be easily moved from one webbing to another. Small hook to fix elastic cords on back packs. Item with double funtion of loop and slider, to be used on back packs.